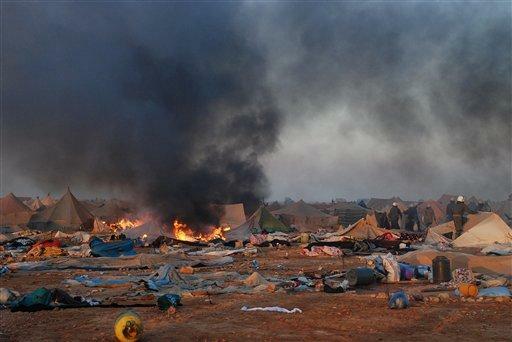 In this photo released by the MAP news agency (Maghreb Arabe Presse), Moroccan forces dismantle a camp housing thousands of refugees in the Western Sahara, near Laayoune, Monday Nov. 8, 2010. Morocco seized control of most of Western Sahara in 1976, following the departure of the former colonial power, Spain. Morocco calls the territory its "southern provinces." But no other nation officially recognizes Morocco’s claim, and human rights violations within the ungoverned territory are rampant. Now, however, the world’s attention is increasingly drawn to the decades-long dispute between Morocco and the Algerian-backed Polisario Front. The focus follows the French military's intervention this year in Mali, two countries to the east from Western Sahara. The U.N. general secretary and the French president both expressed fear that the rise of Islamic militancy in Mali could spread to the Western Sahara territory. To find out more about the conflict, Global Journalist host David Reed spoke to a journalist and author about the dispute over the Western Sahara.